Only 2 minutes of excitement out of 2-1/2 hour trip, however river was beautiful , scenery was great and guide was a hoot! It was such a amazing experience while doing river rafting first time. We were 4 people and we had lots of fun. Our guide was also very funny and talkative. He explained also everything really good. 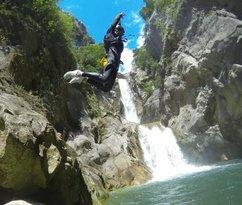 We did also cliff jumping in between. And one guy took also beautiful action photos of us during the 3 hours journey. I would say highly recommended. That was one of the most exciting moments in my entire life. 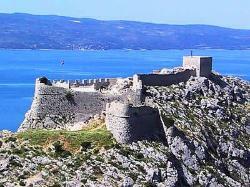 A lot of situations, when I felt an adrenaline and even more when I could watch an amazing views of Croatian nature. That was prepared really solid, so I wasn't bored even for a second. Also a great addition to excursion was our "captain". He made us laugh a thousands of times and told us really interesting stories about river, Omiš and whole Croatia. Very cool trip, I'm sure I'll never forget it. Recommended for everyone! 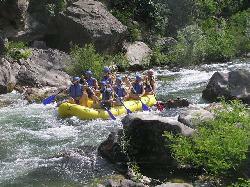 If you want to see the different aspects of the River Cetina there can be no better way than by raft! 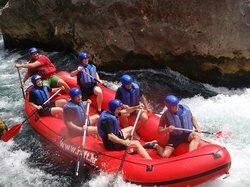 We chose Croatia Rafting since their ratings and reviews on TripAdvisor were glowing and we weren't disappointed. Our guide was Jure (aka George) who was very knowledgeable and entertaining throughout the 11km of our journey. Jure let our group (5 Brits, 2 Germans and a lovely Aussie called Jodie) progress down the river at our own pace. Whilst another boat was keen to reach their destination as soon as they could, Jure took the time to explain the different characteristics of the three sections of the river through which we travelled. Most of the rapids can only be described as "playful" with only one requiring a special procedure known as "bombe" which we were taught by Jure. In short, this was a professionally run operation with a high regard for safety and delivery of much pleasure! We can't rate them highly enough!! !